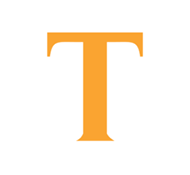 Trendsideas.com is a social design platform which provides users with stimulating ideas, products & services for their projects. 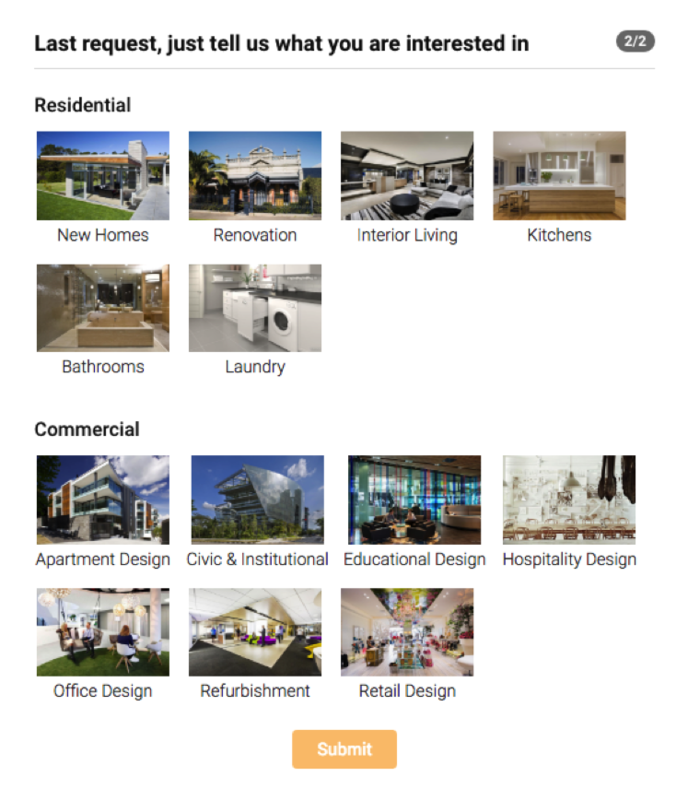 The Trendsideas.com website is a social hub packed with thousands of great ideas for your home building, renovation, interior design and landscaping projects. 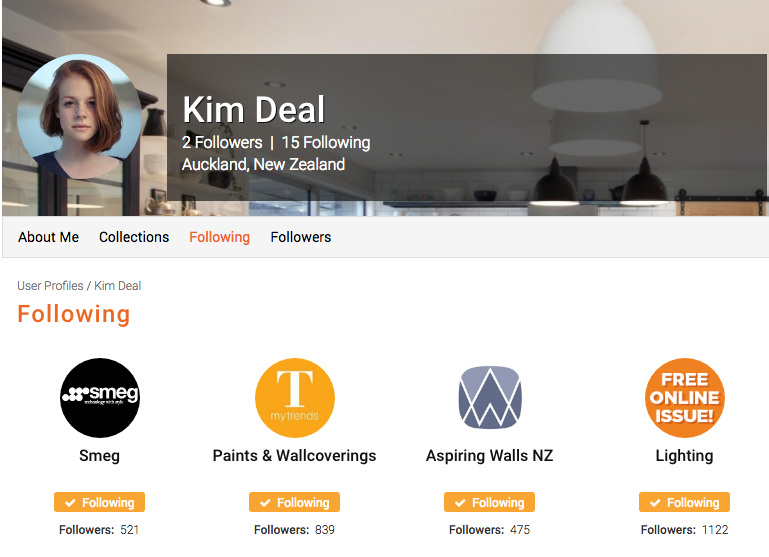 With your personal account, you can save inspiring images, articles and videos to collections that will live within your own profile. 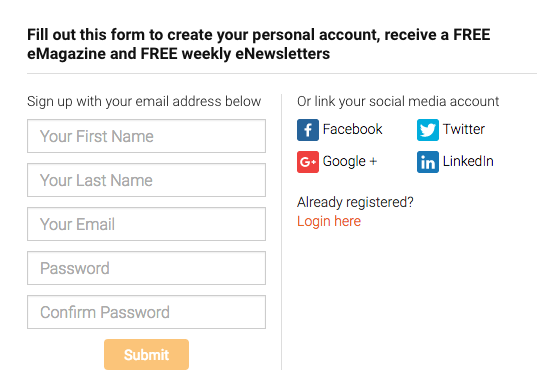 You can sign up using a number of popular social media and email accounts. Now you are ready to make the most of the Trendsideas.com website. To get the most from the website and to have access to all functionalities, make sure you are logged in. Your profile is what sets you apart from every other myTrends users. It’s a great idea to customise your profile with information about yourself, your ideas and your favourite images. This will take you inside your personal profile. It is from this screen that you can update any and all of your personal details and preferences. Remember, to ensure all entries/changes are kept, click the save button at the bottom of the page. To personalise your profile further, you may want to add a special image or a design you love (Cover image). and upload an image that will run across the top of your profile. Remember to Save. The recommended size for your Cover Image is 1170 px x 300 px. 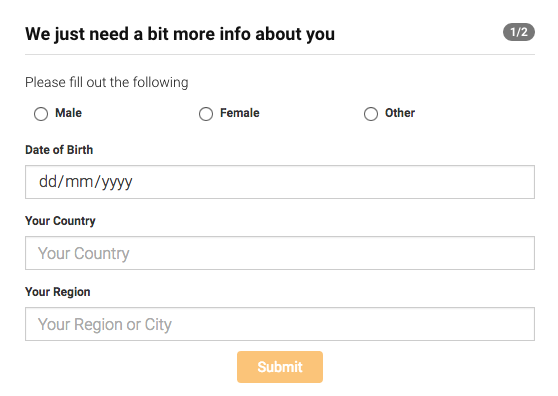 To keep you up to date with the Most Popular content on our site, we will send you an email which will tell you about the content our users are enjoying. You can regulate the frequency you receive these emails directly from the administration area of your profile. Simply click on Notifications, check what it is you would like us to tell you about. Select the frequency from the dropdown, and click Save. You can update your selection at any time. The homepage will help you find your way through the site. Here you will find links to the latest eBook, and the latest articles and collections, as well as links to company profiles, videos and recently added collections. It is also the start point for finding what you are looking for. The top navigation bar is consistent across all pages of the site and this is what helps guide you. 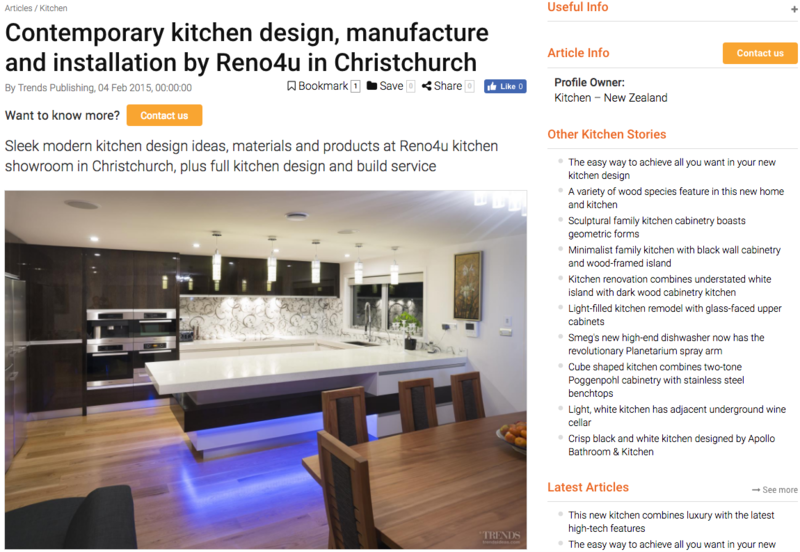 Top right in the navigation bar is where you can set your location to serve content relevant to your country – or view content from other countries. The website is designed to help you find great ideas that you can then save to your Personal Profile for reference and use when you are ready. 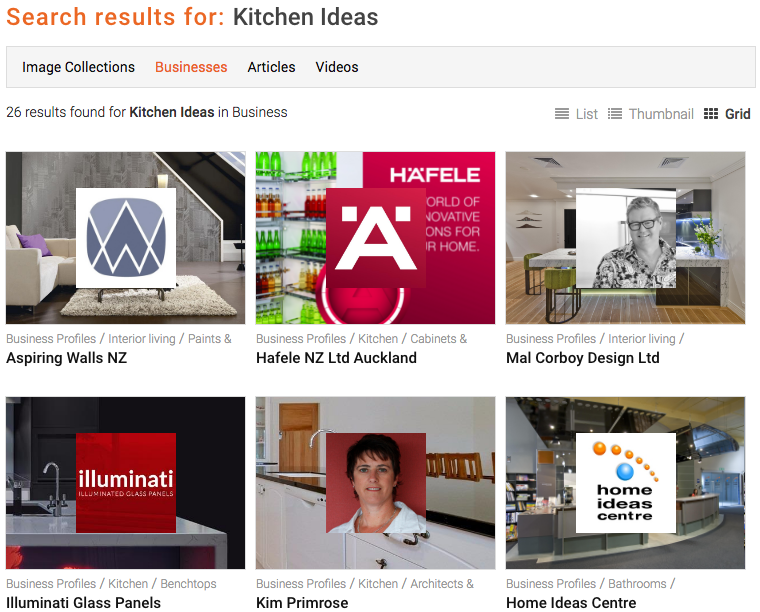 Your search can be by Image, by Business, by Article or by Video. If you search on Businesses you will be introduced to any Trends partners who can provide products or services in relation to your search criteria. Simply click on the company icon to see more information, collections, articles and contact details for the company you choose. 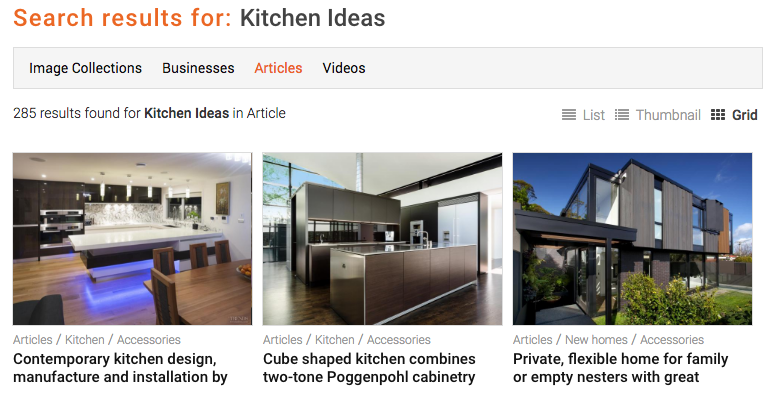 Articles will return full articles trlated to your search criteria. Articles will return full articles related to your search criteria. Click on any article of interest to view the full story and all images related to that article. 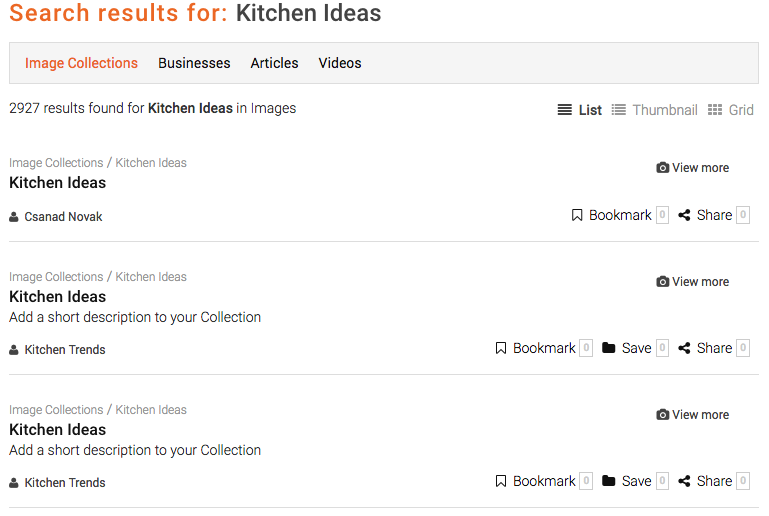 With all search results you have the ability to save the content to your own collections within your personal profile. To do this you click the ‘Save’ button on each piece of content and follow the instructions – see below. When you have found an article that interests you, or a Collection, they will present with a “hero” shot, and a row of thumbnails. 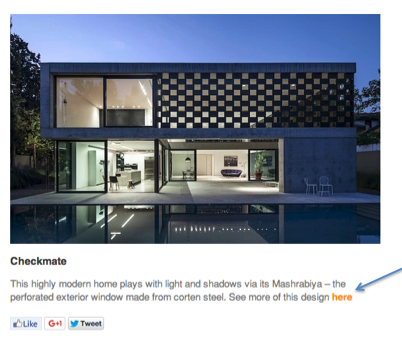 When you click on one of the thumbnails, it will present in this view – with a navigation tab across the bottom. and the complete image will appear. You can save this image to your own personal collection from this screen at any time. You will notice some additional tabs under your personal image – About Me, Collections, Following and Followers. 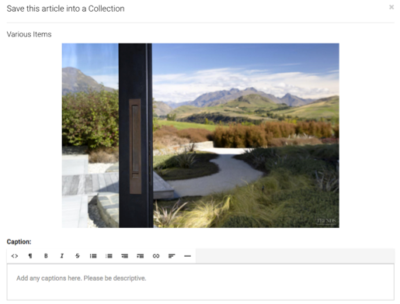 Your ‘Collections’ are where your images and articles will be stored when you save content from the Trends website, and where your own uploaded content will be found. Found content you want to keep? You can save anything you find on the site – whether that’s an article, an image, or even a video. You also have the ability to upload your own content into a Collection for your project – and then can share this with family, friends or even your design professionals. From each piece of content, you will find a ‘Save’ button either at the top, or the bottom of that content. If you are in an ‘article’ and want to save the complete article, use the Save button above the story. 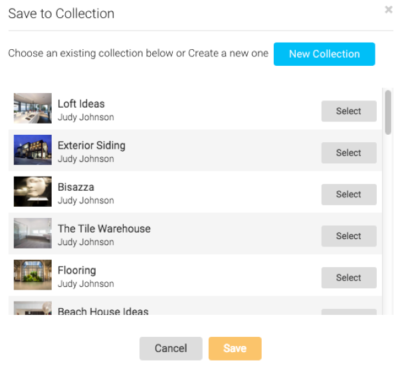 This will prompt you to save the content to a Collection – either a Collection you already have, or you can create a New Collection to save this content to. You will then be able to add any captions or comments in relation to the image. If you are reading an article and there is just one image from that story that you want to save to your collection, click on that image in the gallery – the thumbnails that sit below the hero image and text. From there you can add images from your desktop, give them a caption and Save. Once you register you will start to receive our Trends news communication. This communication is full of great ideas to assist you with your current project or simply keep you up to date with some inspirational content and available product. You can save your favourite content into your profile collections. Simply click on the highlighted link. This will link you directly to the content online where you can save directly into your own Personal Profile and tag the content for your future reference. 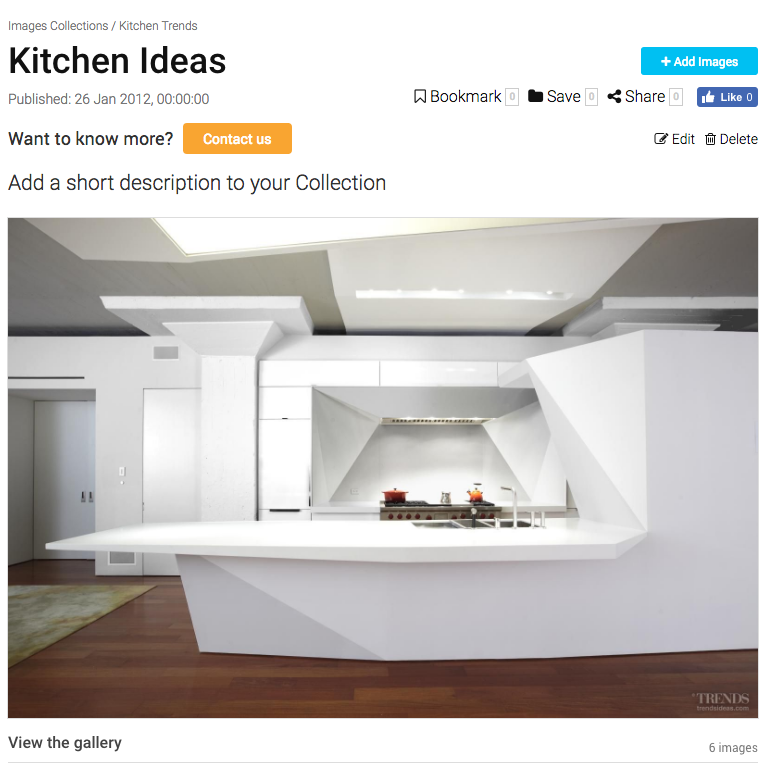 From time to time you find content on the Trendsideas.com website that you want to refer to – as opposed to saving to a collection within your profile. When this happens, each piece of content allows you to Bookmark, Save, Share or Like. If you choose to tag Bookmark, to retrieve your tagged pieces of content you simply log in to your personal profile and use the dropdown menu. Click on Bookmark. 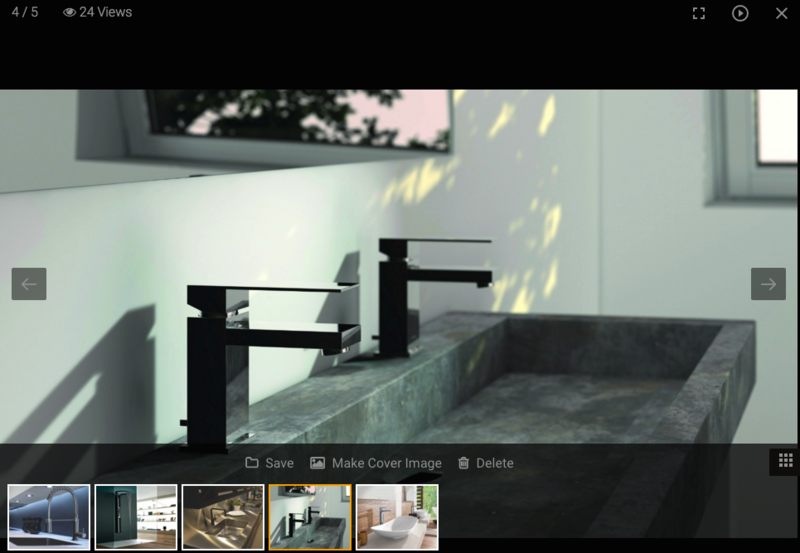 From here you can view your bookmarked content by All, just Articles, Image Collections or Videos. 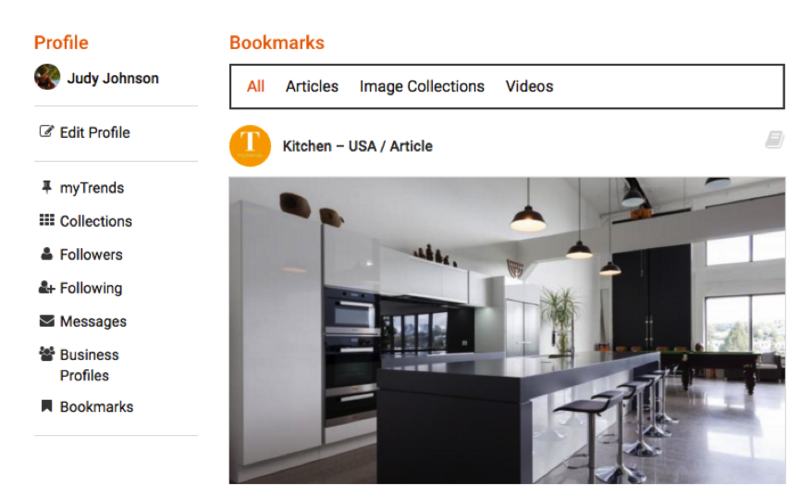 View by clicking on the content and from there you can decide to remove – open the content and visit Bookmark again to remove the Bookmark tag, you can save the article to one of your own collections or create a new collection, or save an image, or share the content. 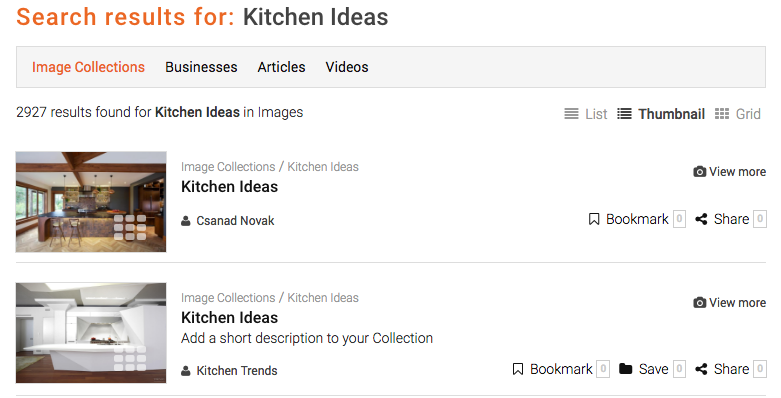 Your Collections are where your images and articles will be stored when you save content from the Trends website, and where your own uploaded content will be found. If you are in an article and want to save the complete article, use the Save button above the story. Select the Collection and click Save. If your images are greater than 4mb in file size then you will need to resize it before you can upload it. Then jump down to Step 3, here you can enter your width and height values. As long as you keep “Keep Aspect Ratio” checked, the system will calculate the corresponding width or height to match the value you entered. Now jump to Step 6, JPG is the best option for photos. It should be checked by default. Step 7, choose the image quality, Best Image Quality will be checked by default. If you want to compress further you can choose “Normal Compression” and enter a percentage value. Anything 80% or above will still be amazing quality. 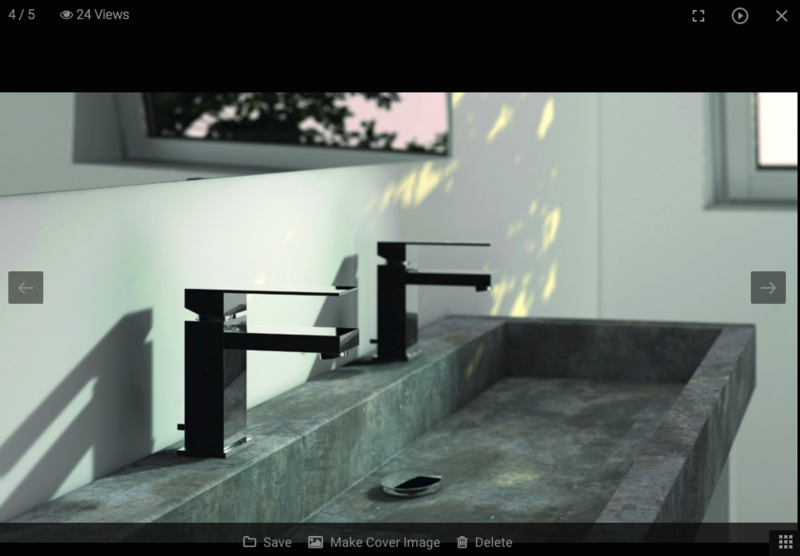 You will now see options that displays links to View Image or Download Image. To get the resized image into your computer just click on the Download Image button. From time to time you will want to share content you have found or saved with others. You can share from any piece of found content – an image, an article or a collection. Within the content you are viewing you will find a share button (next to the ‘Save’ button). 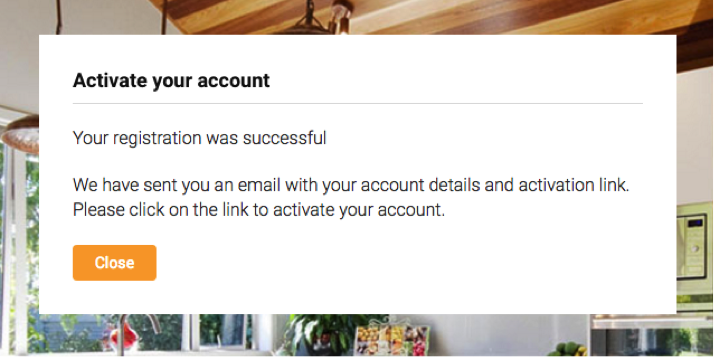 If you choose email – an email message will appear. You can type in your own message, or send the pre-written one which includes a link to your content. 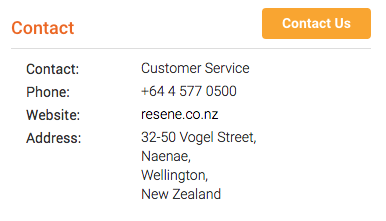 Click on the button, and communicate directly with the owner of that content. The company representative will receive notification that you have sent them a message and will respond. The response will be found in the ‘Message Center’ within your profile – you will receive a notification of that in an email. 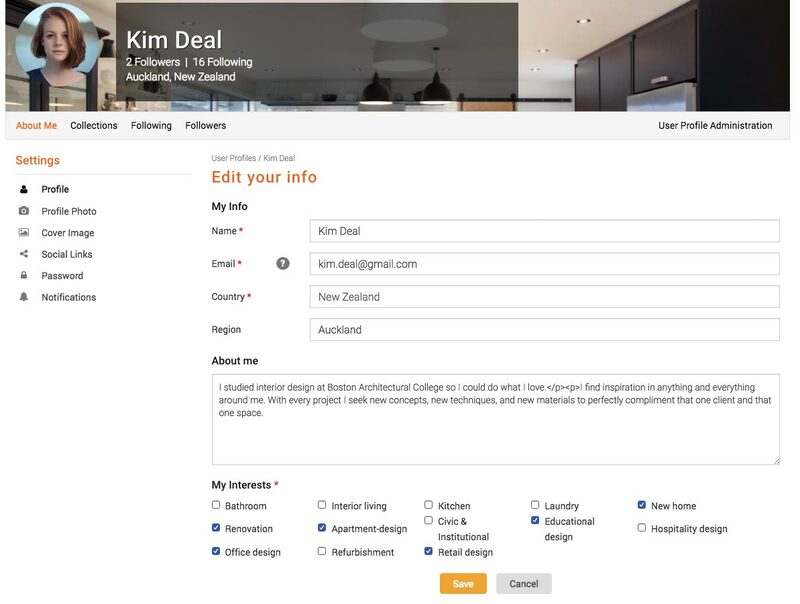 To keep up-to-date with your favourite profiles and/or business contacts, you have the ability to Follow that company or person within the website. 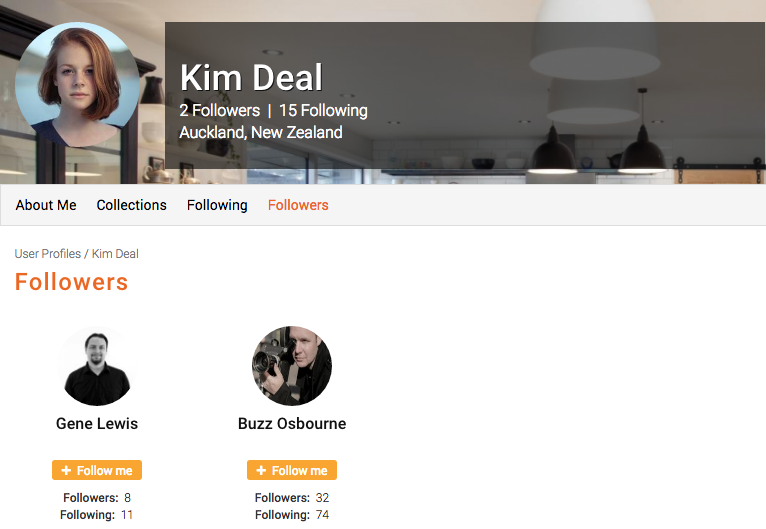 If you are viewing a Business that you want to stay connected to, you will see a Follow button in their Profile Image top RH side. To stay connected with that business, simply click on the blue button and you will find them saved under your Following button within your personal profile. 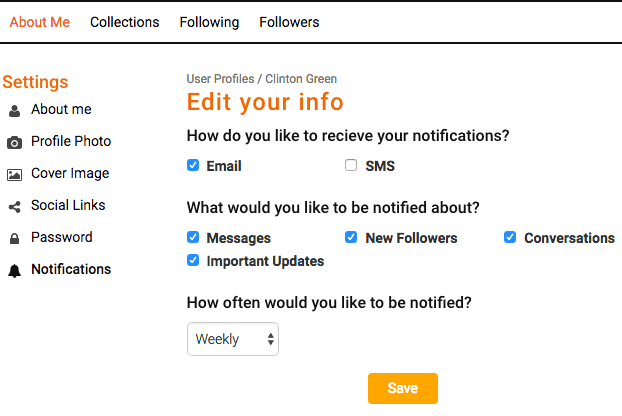 In your profile you can manage and view who you are following as well as see who is following you.